The Product Life Cycle contains five distinct stages. For the four stages introduction, growth, maturity and decline, we can identify specific product life cycle strategies. These are based on the characteristics of each PLC stage. Which product life cycle strategies should be applied in each stage is crucial to know in order to manage the PLC properly. We will now go into these four PLC stages in detail to identify characteristics of the stages and product life cycle strategies for each. The introduction stage is the stage in which a new product is first distributed and made available for purchase, after having been developed in the product development stage. Therefore, the introduction stage starts when the product is first launched. But introduction can take a lot of time, and sales growth tends to be rather slow. Nowadays successful products such as frozen foods and HDTVs lingered for many years before entering a stage of more rapid growth. Furthermore, profits in the introduction stage are negative or low due to the low sales on the one hand and high-distribution and promotion expenses on the other hand. Obviously, much money is needed to attract distributors and build their stocks. Also, promotion spending is quite high to inform consumers of the new product and get them to try it. In the introduction stage, the focus is on selling to those buyers who are the most ready to buy (innovators). Concerning the product life cycle strategies we can identify the proper launch strategy: the company must choose a launch strategy that is consistent with the intended product positioning. Without doubt, this initial strategy can be considered to be the first step in a grander marketing plan for the product’s entire life cycle. The main objective should be to create product awareness and trial. To be more precise, since the market is normally not ready for product improvements or refinements at this stage, the company produces basic versions of the product. Cost-plus pricing should be used to recover the costs incurred. Selective distribution in the beginning helps to focus efforts on the most important distributors. Advertising should aim at building product awareness among innovators and early adopters. To entice trial, heavy sales promotion is necessary. Following these product life cycle strategies for the first PLC stage, the company and the new product are ready for the next stages. The growth stage is the stage in which the product’s sales start climbing quickly. The reason is that early adopters will continue to buy, and later buyers will start following their lead, in particular if they hear favourable word of mouth. This rise in sales also attracts more competitors that enter the market. Since these will introduce new product features, competition is fierce and the market will expand. As a consequence of the increase in competitors, there is an increase in the number of distribution outlets and sales are augmented due to the fact that resellers build inventories. Since promotion costs are now spread over a larger volume and because of the decrease in unit manufacturing costs, profits increase during the growth stage. The main objective in the growth stage is to maximise the market share. Several product life cycle strategies for the growth stage can be used to sustain rapid market growth as long as possible. Product quality should be improved and new product features and models added. The firm can also enter new market segments and new distribution channels with the product. Prices remain where they are or decrease to penetrate the market. The company should keep the promotion spending at the same or an even higher level. Now, there is more than one main goal: educating the market is still important, but meeting the competition is likewise important. At the same time, some advertising must be shifted from building product awareness to building product conviction and purchase. The growth stage is a good example to demonstrate how product life cycle strategies are interrelated. In the growth stage, the firm must choose between a high market share and high current profits. By spending a lot of money on product improvements promotion and distribution, the firm can reach a dominant position. However, for that it needs to give up maximum current profits, hoping to make them up in the next stage. The maturity stage is the stage in which the product’s sales growth slows down or levels off after reaching a peak. This will happen at some point, since the market becomes saturated. Generally, the maturity stage lasts longer than the two preceding stages. Consequently, it poses strong challenges to marketing management and needs a careful selection of product life cycle strategies. Most products on the market are, indeed, in the maturity stage. The slowdown in sales growth is due to many producers with many products to sell. Likewise, this overcapacity results in greater competition. Since competitors start to mark down prices, increase their advertising and sales promotions and increase their product development budgets to find better versions of the product, a drop in profit occurs. Also, some of the weaker competitors drop out, eventually leaving only well-established competitors in the industry. The company’s main objective should be to maximise profit while defending the market share. To reach this objective, several product life cycle strategies are available. Although many products in the maturity stage seem to remain unchanged for long periods, most successful ones are actually adapted constantly to meet changing consumer needs. The reason is that the company cannot just ride along with or defend the mature product – a good offence is the best defence. Therefore, the firm should consider to modify the market, product and marketing mix. Modifying the market means trying to increase consumption by finding new users and new market segments for the product. Also, usage among present customers can be increased. Modifying the product refers to changing characteristics such as quality, features, style or packaging to attract new users and inspire more usage. And finally, modifying the marketing mix involves improving sales by changing one or more marketing mix elements. For instance, prices could be cut to attract new users or competitors’ customers. The firm could also launch a better advertising campaigns or rely on aggressive sales promotion. Finally, product life cycle strategies for the decline stage must be chosen. The decline stage is the stage in which the product’s sales decline. This happens to most product forms and brands at a certain moment. The decline can either be slow, such as in the case of postage stamps, or rapid, as has been the case with VHS tapes. Sales may plummet to zero, or they may drop to a low level where they continue for many years. Reasons for the decline in sales can be of various natures. For instance, technological advances, shifts in consumer tastes and increased competition can play a key role. As sales and profits decline, some competitors will withdraw from the market. Also for the decline stage, careful selection of product life cycle strategies is required. The reason is that carrying a weak product can be very costly to the firm, not just in profit terms. There are also many hidden costs. For instance, a weak product may take up too much of management’s time. It requires advertising and sales-force efforts that could better be used for other, more profitable products in other stages. Most important may be the fact that carrying a weak product delays the search for replacements and creates a lopsided product mix. It also hurts current profits and weakens the company’s foothold on the future. Therefore, proper product life cycle strategies are critical. The company needs to pay more attention to its aging products to identify products in the decline stage early. Then, the firm must take a decision: maintain, harvest or drop the declining product. The main objective in the decline stage should be to reduce expenditure and “milk” the brand. General strategies for the decline stage include cutting prices, choosing a selective distribution by phasing out unprofitable outlets and reduce advertising as well as sales promotion to the level needed to retain only the most loyal customers. If management decides to maintain the product or brand, repositioning or reinvigorating it may be an option. The purpose behind these options is to move the product back into the growth stage of the PLC. If management decides to harvest the product, costs need to be reduced and only the last sales need to be harvested. However, this can only increase the company’s profits in the short-term. Dropping the product from the product line may involve selling it to another firm or simply liquidate it at salvage value. In the following, all characteristics of the four product life cycle stages discussed are listed. 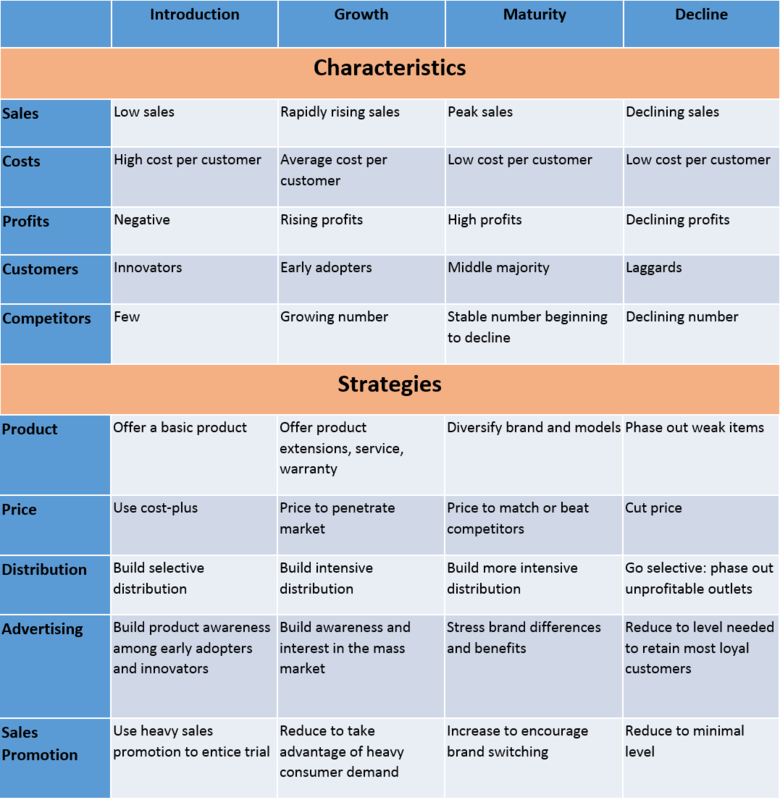 For each, product life cycle strategies with regard to product, price, distribution, advertising and sales promotion are identified. Choosing the right product life cycle strategies is crucial for the company’s success in the long-term.